Black and white REVO comic “SPACE OVEЯ” is now on Instagram! The cult of REVO Energy gets on a cosmic scale, this time in a black and white colour scheme, which is very appropriate for this space adventure story. 2018 was extremely fruitful for the legendary energy drink, one of the first outputs by New Products Group: in the summer, a limited version of REVO™ in a pop-art can with the Cosmonaut appeared in stores, and the Instagram series about the urban adventure of the REVO Can and the Cosmonaut was made. It should be noted that the cool and relatable story about the earthly adventures of a silent but heroic dude in a spacesuit and his talkative and audacious buddy, the REVO Can, attracted an army of fans and over a million views on the web. Later, a collector’s edition of comics was printed based on the plot of this series, which was presented at Comic Con Ukraine 2018. There were also fan meet-ups, a special issue with New Year’s gifts from Santa Cosmonaut… And here comes another “explosive” event – the year 2019 is starting promisingly! 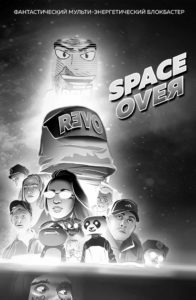 In the Instagram stories on REVO’s page, the first part of the black and white REVO comic “SPACE OVЕЯ” on the plot of a fantastic multi-energy blockbuster has just been published. Thus, REVO Energy has made another step to be closer to its fans, because the printed version of the comic was limited – the collector’s gift edition had only 1 thousand copies printed, and the demand was much higher than this amount. Now everyone has access to several pages from the comic book – it has the plot of the first episode of the first season of the series. However, in the future, fans are promised a daily portion of the space adventure! Every day REVO™ and Cosmonaut will upload one episode, and when the entire first season will have appeared on Instagram, an electronic version of the entire comic will also become available to users. So, in anticipation of the second season, fans will not get bored. And the first season of the series about space, love and the challenges of the big city, which the REVO Can helps to overcome, can still be viewed on the Instagram page and on the Revoenergydrink Youtube channel.